← NoMad Blog is on the Move! Alright, so I’m not going to say this was my mom’s fault, but I am going to say that she’s to blame. As we all know, Jeanie Carroll has an undeniable knack for forcing people to do things they don’t want to do, and several times in my life this something I didn’t want to do was go for a long walk while a natural disaster/storm was happening outside. During the Blizzard of 2001, Jeanie made me, Jamie and Jack the Dog walk all the way to the Holleder Center to catch Dad’s basketball practice. Halfway there, Jack’s glom was frozen to his face, and Jamie kept screaming “I’m not in a very good place!” When Jeanie came to visit me in January 2010, she forced me to walk the 3 miles to and from Zaftigs in Coolidge Corner. My body hurt so, so much the next day, since I was bracing myself for a fall on the ice the entire time. And most recently, in North Carolina last weekend, Jeanie led a group along the “trails” of Cary, only to be caught in a torrential downpour from which my clothes have still not dried. 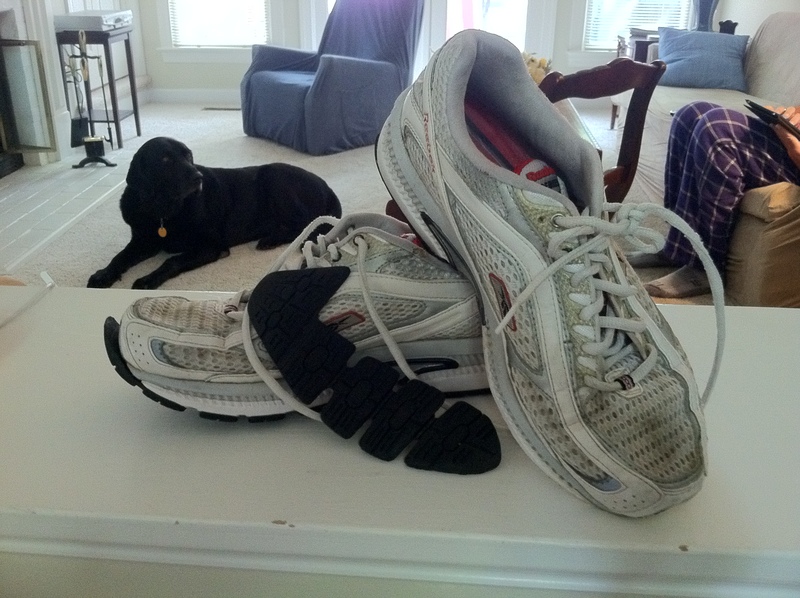 And this, of course, resulted in the destruction of my most beloved sneakers. Now I fully admit, I get oddly attached to inanimate objects and it’s totally weird. But to say these sneaks had lived a lot of life would be an understatement. 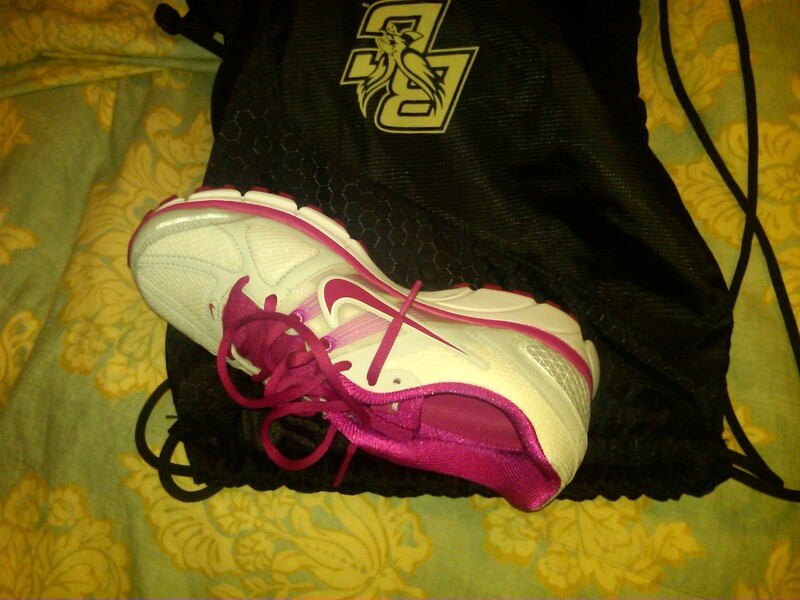 They were issued to me almost 6 years ago by the BC Athletic Department as part of my standard manager gear. They’ve been to countless practices, shoot-arounds and Popeyes restaurants. They sat courtside during Coaches vs. Cancer’s Suits and Sneakers weekend, and they’ve helped support a lot of luggage movement, Powerade making and shotclock working. I think it’s even fair to say they earned a varsity letter at Boston College. But on top of all this, I never was one to love picking out shoes. My family likes to lovingly say that I have “Fred Flinstone feet,” so you can guess that finding a pair of shoes that fit comfortably is a challenge. These sneakers were the best. And I’m upset that they’re gone. Unfortunately, there wasn’t really a lot of time to mourn because I don’t want to become 5,000 pounds over the next few days. I had to find new shoes immediately, and I think I’ve found a nice pair of the Nike Pegasus 28+ persuasion. They’re really lightweight, and wide, with great laces (I don’t know if the laces are an important aspect of the shoe, but you know when laces just aren’t long enough and you can’t really get a good knot when you tie them? I hate that. So again, these laces are pretty great). I’m not so thrilled that they only come in bright hot pink, but I guess that’s just something I have to get used to. I’ve only worn the Nikes once, but they did their job. So I’m excited to wear them again. However, they should know they have pretty big shoes to fill. Pun intended. Yes it was sad to witness the death of your beloved sneakers, may they R.I.P. But I love those new hot pinks Nikes, give them time Kels!